In the early short story-years of John D MacDonald's writing career he was such an amazingly prolific author that his works occasionally appeared along side each other in the same issue of a magazine. It was not uncommon in his pulp years to have two, three, once even four stories appear in the same fiction monthly, and when that happened, pseudonyms were employed. It was the editor's belief that variety sold better than name recognition, and for every fan who would jump at the chance of purchasing a magazine with more than one JDM story, there were probably two who would pass it up because they didn't want to read two stories by the same author. The reasoning, I suppose, was that the fan of MacDonald (or any other prolific author) would likely buy the magazine anyway, so why take a chance. According to MacDonald's bibliographer Walter Shine, this practice "was done with MacDonald's acquiescence but not at his request," and the names used were not unique to the author. Shine cites one example of a story called "The Tiger" which appeared in the December 1946 issue of Doc Savage under the byline "Peter Reed." This pseudonym was the one most frequently used by JDM in a variety of different magazines, but "The Tiger" is not a John D MacDonald story. The only known case of MacDonald intentionally utilizing a pseudonym was when he wrote a monthly column for a couple of regional west coast Florida magazines back in the early 1960's. "Off the Beat" was a feature of both The Lookout and Newsmonth from November 1959 until June 1961 and was published under the name "T. Carrington Burns." MacDonald's authorship of this column was a well kept secret until Shine discovered it 1978, much to JDM's surprise. 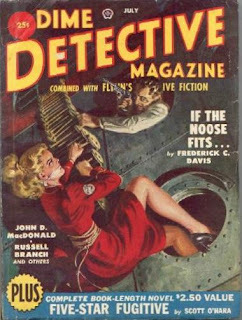 The magazines where this practice was common were invariably fiction pulps; JDM never used a pseudonym in a mainstream slick. I am aware of at least five cases of the use of a house name where a JDM story appeared by itself, without another credited entry in the same issue. One wonders what the rationale for this practice was, other than to possibly give a magazine's readers a rest from an overly-prolific author. Still, that does not explain the most curious use of a house name, for MacDonald's "A Handful of Death." Published in the June 1946 issue of Doc Savage, it appeared without another John D MacDonald story alongside it in the table of contents, it was MacDonald's first-ever story published in that particular pulp, and it was only the second JDM story ever to be published in a newsstand-available publication. I'm sure there's a story behind this odd substitution of names, but I'll be damned if I can figure out what it could be. Imagine poor MacDonald, pounding out product for over six months, finally getting some sales and his second appearance in print doesn't even have his name on it! The most notable JDM stories published under a pseudonym? There are two of them. In the famous July 1949 issue of Fifteen Sports Stories where MacDonald had four stories published, his "Blue Water Fury" was printed under the Scott O'Hara pseudonym. It was one of the author's favorite works and, although he had originally titled it "Freedom by Violence," he eventually republished it as "The Big Blue" and included it in his 1966 short story anthology End of the Tiger and Other Stories. The other was a novella he sold to Dime Detective in 1950. Appearing in the July issue of that magazine as "Five-Star Fugitive" (again, under the Scott O'Hara house name), he re-titled it "Border Town Girl" and included it the eponymous 1956 collection that also featured the original publication of "Linda." A couple of oddities to add to this: JDM used "Peter Reed" with at least two publishers. Super Science Stories was from Popular and Doc Savage was from Street & Smith. I thought most of the pulp pseudonyms stayed with either the publisher or the author, but not both. Two possible reasons for pseudonyms being used but not the author's real name: Covers were often printed earlier than the rest of the magazine. So it's possible they stuck a name on the book and then grabbed a story to fill it, or the plan was originally for two stories but for some reason one fell through. Alternately, a story may have been advertised in the previous issue, and then written to match after the fact (or something in inventory that could somehow fit being renamed to work.) The cover theory wouldn't work on June 1946 Doc Savage, but it's a generic enough title that they could have stuck it on the JDM story to match something listed in the previous issue. That's a good possibility, Eric. Anyone owning a copy of the May 1946 issue of DOC SAVAGE care to check? "Sing a Song of Terror"